Should an Athlete Drink Cold or Warm Water? Perhaps the most important aspect of an athlete's diet may be his fluid intake. According to the University of Missouri Extension, an athlete may begin to experience dehydration after losing as little as 1 percent of his body weight. In addition to feeling thirsty, dehydration can lead to a number of potentially dangerous conditions. Because the body absorbs warm liquids in a different way than cold liquids, temperature matters. While the human body can go for weeks without food, it can survive only a few days without water or other liquid. When you exercise, you increase the amount of liquid your body needs since you lose fluids through increased sweat and respiration. Additionally, your body heats up due to the increased number of calories you burn. Drinking cold water cools your internal temperature and helps it maintain homeostasis. Colder drinks are often more palatable and may encourage you to drink more. The University of Rochester Medical centers urges athletes to pay attention to the weather when exercising. In hazy, hot or humid days, your body could heat up faster than normal. Drinking colder drinks will help keep your internal temperature down and taste better when it's hot outside, which may encourage you to drink more. In colder temperatures, warmer drinks -- those at or about room temperature -- may be more beneficial at keeping your internal temperature optimal. The average adult uses about 4 cups of water a day for respiration. Athletes and people who are physically active need more than double that amount each day. Athletic performance degrades after losing just 1 percent of your body weight in liquids. The American College of Sports Medicine recommends that athletes start drinking soon after commencing an exercise and continue drinking at regular intervals to help replace fluids lost during exercise. The College recommends that fluids be cooler than the ambient temperature, but they do not recommend icy or frozen beverages. Drink plain water for exercises lasting up to 1 hour and consume beverages containing carbohydrates, such as sports drinks, during exercise lasting longer than 1 hour. Avoid carbonated beverages, sugary drinks and highly concentrated fruit, as they may cause stomach cramps, nausea and diarrhea. Staying hydrated, whether you drink warm or cold water, is important. Dehydration occurs when your body loses more fluids than it consumes. Dry mouth, thirst, headache or dizziness can indicate mild dehydration. Symptoms of severe dehydration include lethargy, agitation, low blood pressure, rapid heartbeat, delirium or unconsciousness. Severe dehydration eventually results in death. 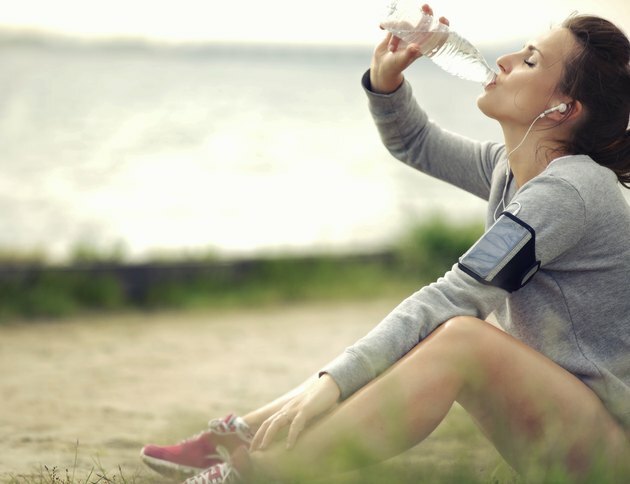 Why Drink Water After Exercising? Should You Not Drink Ice Cold Water After Exercise?